A drawing or painting of a bird or animal without some indication of characteristics of its fur, wool or feathers would be largely meaningless, so the artist needs to be more imperative in this field than in any other. Animals and birds, unlike still life subjects, cannot be studied at leisure, so an extra measure of ingenuity, combined with patience, is needed even to make the preliminary observations that will enable you to capture their forms and textures accurately. The best way to begin is with familiar subjects. If you have a pet dog, cat, rabbit or parrot, spend some time drawing and observing them, try to understand the way the fur, hair or feathers clothe the forms. One of the major difficulties in drawing birds and rough or long-haired animals is relating the ‘top surface’ to the body below. Once you can get this right you are halfway there and can enjoy yourself finding ways of expressing the textural qualities. In the case of fur, light can often be very revealing. 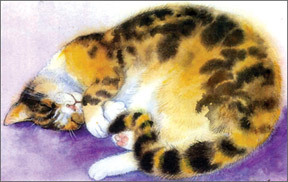 You are unlikely to be able to deliberately light your pet as you might a still life, but if your cat has a habit of sitting on a window sill for long period of time, so that it is lit from behind, study the way light interacts with the edges of the fur and make a few drawings with chalk or a soft pencil to see it is lit from behind, study the way light interacts with the edges of the fur and make a few drawings with chalk or soft pencil to see if you can capture the main tonal areas. Animals make delightful painting subjects but, unfortunately, they tend not to sit still for long. It can be very frustrating when your model suddenly gets bored and wonders off, leaving you with a half-finished painting and for this reason many people prefer to work from a photograph of their pet. Generally, however, this is not a good idea because photographs tend to flatten form, distort colours and reduce textural details. They also ‘freeze’ the pose of the animal and this often means that the finished painting too, lacks life and movement. Rendering the soft texture of animal fur also presents problems for beginners. The students use too many stiff lines and strokes, with the result that the cat’s fur more closely resembles a porcupine’s quills. This same mistake is often made when painting human hair, the novice painter attempts to render individual hairs, instead of suggesting the bulk of the hair in terms of soft masses. It may not always be easy, but painting an animal from life will in the end give you better results than copying from photographs. The secret is to choose a suitable time when your pet is completely relaxed - when it is snoozing after meal or basking in the sun and then paint as quickly as possible. Observe the illustration I have done on the cat. I have titled the picture ‘Nancy A sleep’. I have used the fluid properties of water colour paint to capture the sleek, sinuous form of the cat and also the soft texture of its fur. While the cat napped, I quickly blocked in weak washes of Naples yellow and yellow to establish the curled shape of the body. Then modelled the contours of the head and body with stronger washes, building up the major planes and masses much as a sculptor would. The dark patches were added with Burntumber next, using light and dark washes of ivory black, well diluted. The finer details were left till last. Since speed is of the essence, this is the most sensible approach to adopt. Then even if the animal changes position, you can fill in the finer details such as the nose, claws and the whiskers without too much difficulty. I have shown in detail how the soft texture of the fur is created by brushing in the darker colours while the lighter ones are still damp. If a colour is too dark, or spreads too far, it can be gently blotted with a tissue or soaked up with blotting paper. Many people are daunted by the prospect of drawing fur because they see the complexities first without considering how information could be simplified. To begin with choose an animal that you are familiar with for example, cat, dog or rabbit or work from a photograph, which will allow you to practise at your own space. Some times texture can be merely hinted at by picking out a few details, but for realistic studies of animals or birds you will need to pay special attention to the textures. The fur of a cat, the animal’s most attractive and noticeable feature, invites more detailed treatment. To capture the smooth, downy appearance of animal fur, use fast, flowing strokes and think in terms of masses rather than lines. Work up gradually from the palest tones to the darkest, allowing each succeeding wash to blend into the previous one just before it dries, so that fuzzy edges form. Finally, draw in just a few of the fine, long hairs using the tip of a very fine brush, as No 1 or No 2 sable hair artist brushes.